The first time I went to Yankee Stadium was in the summer of 2006. I don’t care for the Yankees but I love stadiums, and the concrete mothership in the Bronx was one of the most legendary. Someone offered me tickets and I said yes immediately. This was the old stadium, the one that Ruth built. The one where Murderer’s Row committed so many of their atrocities. The one where Yogi philosophized, where Mickey, Gehrig, and Jeter played too. This was hallowed ground. This was the stadium that was “renovated” in the 1970’s to address a number of structural and aesthetic issues, but still left the concrete corridors feeling like human subway tunnels. The one with the unmistakable architecture that rises like the Colosseum as the 4 Train rolls up from below ground and onto the 161st Street platform. The one with the echoing voices of past heroes bouncing for eternity in grayish-blue-painted infinity. This was the stadium where George Costanza worked for crying out loud (Steinbrenner too, of course). This was a place of history, a place of majesty, a place that took my breath away. They built the new stadium next door to the old one, and that place, today’s Yankee Stadium, still brings chills. The new building is a noble tribute to the old one, with much of the same architectural features coupled with a cleansing of the obvious issues (and only some of the bewitchery) in favor of cleaner lines, better design, and wider concourses. The new Yankee Stadium is such a compelling homage that one can only hope in another 100 years that whomever designs Yankee Stadium, Part III does as admirable a job. If it’s not the Yankee Stadium, it’s certainly a Yankee Stadium. Yankee Stadium is a place built for baseball: the unmistakable diamond shape, the batter’s eye, the beaming foul poles. And yet, Yankee Stadium with football lines is a picture as old as the stadium itself: the New York Giants made their home in the Bronx for years before moving to New Jersey. Yankee Stadium with soccer lines is a novelty, and one that is truly charming at first glance. Like the National Hockey League’s series of outdoor games or Roger Federer and Andre Agassi playing a tennis match a thousand feet in the air in Dubai, the visuals are unique and unequivocally fun. It’s a spectacle and a good one at that. Like any spectacle and like each of the other examples, these are not long-term solutions. Not for a hockey franchise, not for a tennis tournament, and not for a soccer team. Yankee Stadium as a baseball field is a place where the sublime happens 81 or more times a year. Yankee Stadium as a football field is a leather-helmeted throwback, one that is still capable of a late-season magic. 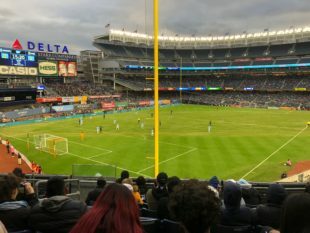 Yankee Stadium as a soccer field is an abomination of a pitch, one that acts as a pock mark on the otherwise impressive soccer franchise and on Major League Soccer as a whole. I caught a batting practice home run on that first trip in 2006. When you’re one of the first people to arrive and you sit along the foul poles, you’re bound to be in the way of a ball or two over the next several hours. I don’t have much in the way of sports memorabilia, but I keep that ball on a shelf in my office like Scotty Small’s dad. I’ve been back to this place several times since 2006, for baseball every time except 2015. That day, I followed the Union uptown to watch all three City Designated Players find the back of the net in a 3-2 win for the home team. My soccer hero Andrea Pirlo, author of the actual book “I think, therefore I play” and the hypothetical book “Work smart, not hard: Foreward by Carlos Valderamma,” scored a second half free kick goal so impossibly cool that no one on either team needed to move. The ball was already in the goal before it was kicked, mind over matter… penso, quindi gioco. It was a moment of heart-breaking magic, like seeing the puppy you put up for adoption because your apartment stopped allowing pets out on the street again, happily leashed to a new family that wears nicer clothes and has better looking children. It was beautiful, and it hurt. I made the trip again this past weekend, senza Pirlo, and sensing the best Union team ever might have a trick or two up their sleeves. You likely know what happened next, and if you don’t there’s a match report and some player ratings for you to peruse. The team cracked, they wilted. They argued with each other, they cried, and in the end, they got exactly what their captain and their midfield distributor were passive-aggressively hoping for last week anyway: an away playoff match. The catch? They have to play their away match right back where they earned it, in the most hallowed ground for baseball ever built, and the worst soccer pitch in all of the world’s first divisions. Author’s note: That might be hyperbolic, and there are lists upon lists out there focusing on this topic, but can any real Bottom 10 list exist without this hole in the American soccer landscape? Yankee Stadium won’t change, that’s what makes it so endearing. Neither will the Union, that’s what makes them so frustrating. If one is the immovable object, then the other must be the unstoppable force. On Halloween night, we’ll find out which is stronger. Watching soccer at Yankee Stadium which I’ve done one time- as Sebastien Giovinco shredded NYCFC for 3 goals and 1 assist… is crummy. Watching baseball at old Yankee Stadium which I’ve done from many different seats is a lesson in scintillating culture. Climbing those stair into the upper deck, literally straight up, one step after another higher and higher, and when I mean straight up-straight up –with a head on, the dizzies, and two in the hands was mildly terrifying. That no-one ever fell to their death in that stadium having won 26, I believe World Championships there, is remarkable. Near as I’ve ever been able to figure from the TV, the pitch is the same size as Haverford School’s varsity field, 68 wide and 104 long.